We knew back in May when we got the Barry M Summer Gellies that we would be wearing some of them into autumn. Elderberry is one of those transitional shades. It's a beautiful, dusky blue that is great for this time of year as it's not too wintery but not so summery that people wonder what on Earth you're playing at! I used two coats of Elderberry on all of my nails except the one on my ring finger. For this I used two coats of Coconut* from the same collection. Coconut* has quickly become one of my all time favourite shades. It's great on its own or, as we prefer, as a base for designs. It's not as in your face as white which makes such a difference to how our designs turn out. 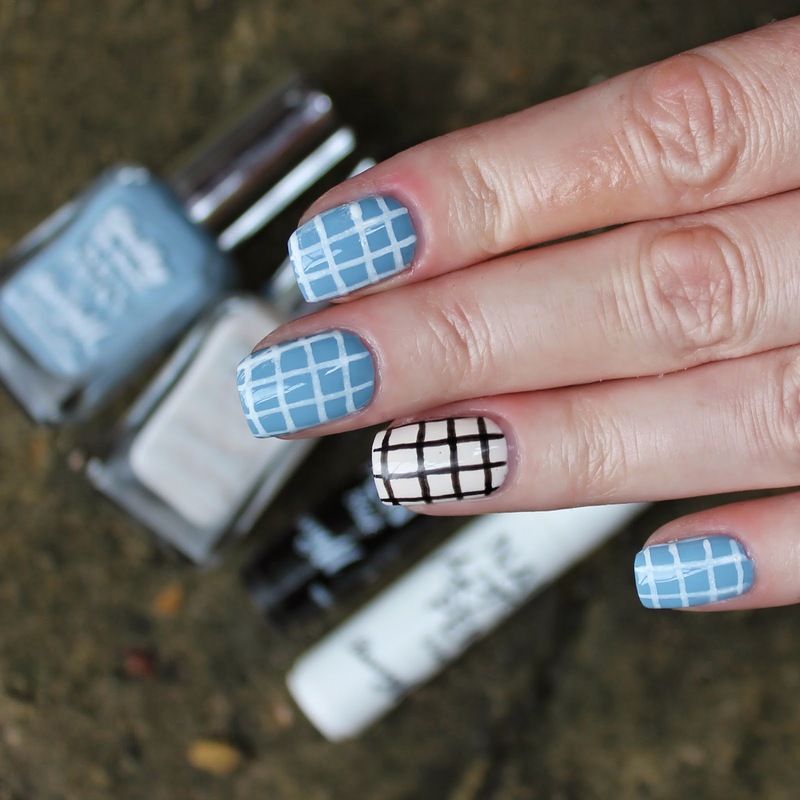 I used my black and white Barry M nail art pens to create the grid pattern. I just drew on lines to form squares, no great science behind it! When we kindly get donated shades from Barry M we end up sharing. This usually works quite well as we have different tastes in colours but the ranges this year have been so hard to split. I ended up buying this shade as I loved it so much and kept getting jealous when Jo used it! I'm pretty sure she purchased her own Coconut too. We can't get enough! Jo reviewed the new autumn shades recently but we think we'll be wearing a lot of the summer ones for a while too. How about you? Ooh I love this colour combination - it's perfect for this time of year!